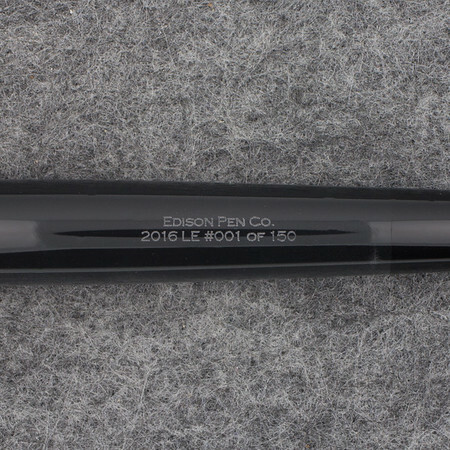 Edison Pen Co – 2016 LE Group Buy Stealth Glenmont! 2016 LE Group Buy Stealth Glenmont! It’s time for our annual Signature Line Group Buy Pen! 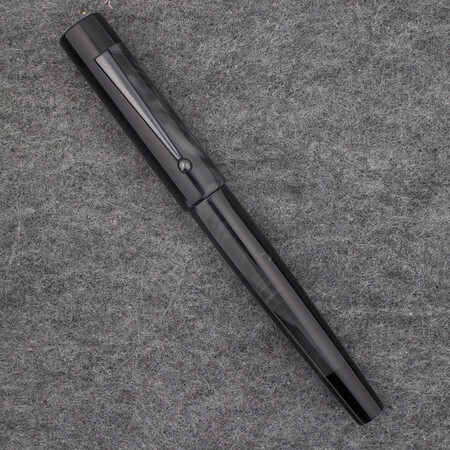 The 2016 Group Buy Limited Edition Pen is a converter filling Stealth Glenmont! As opposed to previous years, we are not doing a buying and waiting period for the Group Buy Pen. Instead, all of the pens are currently made and ready to ship! These pens are made with solid black acrylic end caps and section. 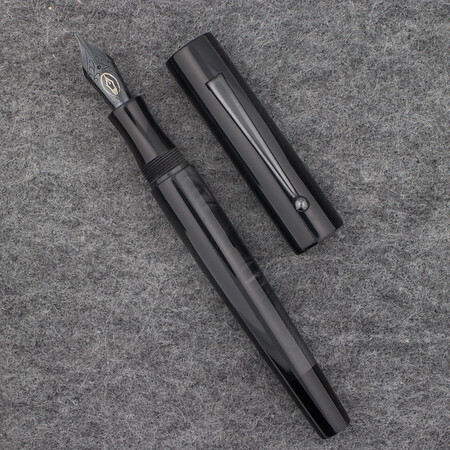 The barrel and cap are made from a pearlized black acrylic that has plenty of pearlization and depth, but is not too visually “busy”, keeping with the stealth theme. 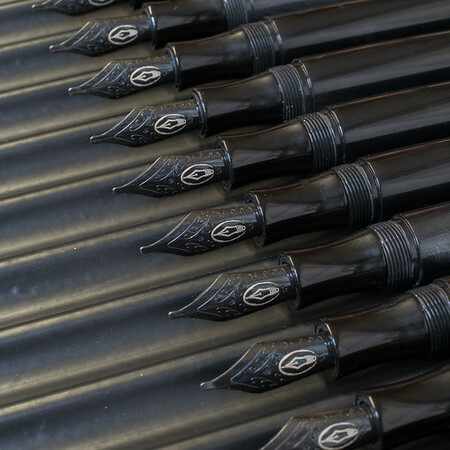 The clip and nib are given a black oxide treatment for a nice deep black appearance. All pens will carry a Limited Edition numbered engraving. The edition will be limited to 150 pens. The nibs are available in steel only. Tip sizes can be EF, F, M, B, 1.1mm italic, or 1.5mm italic. Price is $185 for this pen (normally $250). Be sure to watch the video above for all details. Lastly, if you would like to add any of our leather goods to this order, you can do so by adding those items to your cart in addition to the pen (the leather sleeve that fits the Glenmont is the Medium size). You can click the link above to purchase. Hey Brian, the Stealth Glenmont looks great! You know, I’ve been pining for one of your pens for about 4 years now. SO many times I’ve wanted to hit the button. With this group buy, I just couldn’t take it any longer. Thanks for putting it together, explaining everything in the video & thanks for sending me the 007!!!! HA! Anyway, really looking forward to inking this guy up to send you a thank you note. Being in a different timezone, I didn’t see the announcement until now. So disappointed to see that it’s sold out already (great for you guys of course). I’m guessing there wouldn’t be a second batch of this? Hi Serena. Thanks for the kind words, and I’m sorry that you missed out! I really wish that I would have made my warning about them selling fast a little firmer in the video, but we were totally caught off guard! I really didn’t think that they would sell so fast! Now of course, we can make any pen custom for you. If you like this theme, we can incorporate it into any custom pen. Thanks! I am so glad that I did not wait to get this wonderful pen. I intend to ink it up with Noodler’s Lexington Gray. Got the notice that it has shipped, so I expect it might get to me Saturday. Brian, my first Edison pen, the Beaumont, was bought from Goulet Pens last January, and I’m glad this one will be my second one. Congratulations on selling all the lot of pens in 11 hours! Excellent thanks for the kind words Thomas! Enjoy!